An activist group in the United States has been carrying out deeds that some might think the stuff of dreams - buying and cancelling other people's student debts. Rolling Jubilee has purchased and abolished $3.8m (£2.35m) of debt owed by 2,700 students, paying just over $100,000 (£62,000), or as it says, "pennies on the dollar". The campaign group, which wants to "liberate debtors", says it takes its name from the tradition in many religions of marking a "jubilee" celebration by freeing people from debt. An offshoot of the Occupy Wall Street protest that began in New York, the campaigners, funded by donations, say that more than three quarters of US households are in debt. 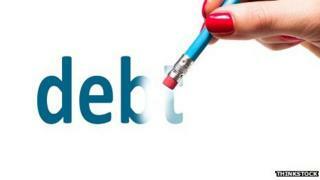 Debts can be bought and sold in the financial marketplace. But student debt, which has spiralled to an estimated $1.2 trillion (£619bn), is not usually as available to buy as other debts, such as unpaid medical bills. In this speculative secondary market, third parties buy debt for a fraction of its original cost and try to collect the full amount from debtors. But these debt campaigners are buying debts and then writing them off. The student loan debts cleared by Rolling Jubilee were for students from Everest Colleges, a string of institutions owned by Corinthian Colleges, a for-profit education company. A Facebook group is overflowing with reports of people having to pay back hundreds of dollars each month while working minimum-wage jobs. Last month, the Consumer Financial Protection Bureau said it was suing Corinthian over its lending tactics. Laura Hanna at Rolling Jubilee says the student debt situation amounts to a "bubble". The group pulled off the deal to illustrate how cheaply the money owed can be sold on the secondary debt market, she says. "We wanted to question the morality around repayment," she says. "Your debts are on sale. They are just not on sale to you." Ms Hanna says the problem lies deep within the structure of the education system and the way that selling education as a commodity reinforces inequality. Many of Everest Colleges' debtors are single mothers and are on low income, she says. "It is documented that they end up worse off and have no better chance of getting work than if they simply finished high school," she says. The group is hoping to show students that if they work together, they can renegotiate their debt. Its debt collective has 350 Everest College students who are working to renegotiate their debt with the student loans companies and refuse unfair debts. In the past few weeks, she says thousands more have signed up. At the very least, says Ms Hanna, students have another tool for negotiating their repayments. "As an individual, you should feel morally compelled to renegotiate that amount." Dawn Kaylor is a 49-year-old single mother from Illinois. She is one of 40 million people across the country in debt because of their student loans. She studied law at one of the Everest Colleges and owes $177,000 (£110,000). "I live in fear and worry every day about what my future holds. "It's a very scary and depressing situation to be in. The scariest part is there is no way out. "There is no relief, other than death." Ms Kaylor recently joined the collective to try and challenge her debt. She now works in a bank, which pays minimum wage. She says she can pay back only $90 (£56) a month - but that is because she has deferred two of her loans as she is still technically enrolled at the college. When she has to start paying back her loans in full, she says she won't be able to pay for medical care. "I will probably lose everything I have," she says. "Including my home." Student debt can pursue people all through their working lives and into retirement. The United States Government Accountability Office published figures last month showing there were more than 700,000 households with people aged over 65 still repaying student debt. These pensioners still owed more than $18bn (£11bn) - and officials giving evidence to a US Senate committee said this could mean that student debt repayments could be deducted from retired people's social security benefits. More than half of student debtors who are over 75 are in default on their loans. This week, the Federal Reserve chief Janet Yellen warned the quadrupling of the student loan debt since 2004 represented a barrier to social mobility. John Aspray, national field director at the United States Student Association (USSA), said recent changes in law mean people in medical or gambling debt can declare themselves bankrupt - but to do so for student debt means satisfying an '"undue hardship" criteria, which is very difficult to prove. "Opportunities for renegotiating are very well hidden," he says. He says Rolling Jubilee's work was "important and symbolic" as a lot of people "don't even consider" getting rid of their debt. As 85% of student loans are guaranteed by the national government the USSA is putting pressure on the department to "cut contracts with the worse corporations", says Mr Aspray. "Political reforms are needed," he says. "We are going to see people continuing to rebel against this." United States Student Association - Education is a right!